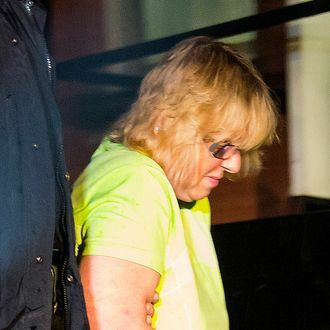 Joyce Mitchell, the prison seamstress who pleaded guilty on Tuesday to helping Richard Matt and David Sweat escape from Clinton Correctional Facility, spoke with investigators at length about her role in the strange prison break. NBC News obtained some of the statements and reported all the seamy details today, which make it seem even more unbelievable that no one knocked over this Jenga tower of a plan. This whole saga began when Matt asked Mitchell, who worked with him in the prison tailor shop, to call his daughter and see if she received a painting he had sent her. Matt was a minor celebrity in the upstate New York prison for his portraits. Obviously the last item on that list never happened; Mitchell instead went to the hospital because of her panic attacks. When investigators got in touch the following day, she fibbed. By the end of the weekend, however, Mitchell began explaining her role in the escape. She could face up to seven years in prison, and is scheduled to be sentenced in September.